This meat sauce is a ridiculously long time coming. We don’t go out for supper a lot because I love to cook, but if we want pasta? Luiggi’s is our pick. I’ve talked before about my favorite order there, but never about my Main Taste Tester’s. His favorite? The Ragu. He flips his lid over their Ragu every single time and demands that I recreate it every single time too. Truth be told? I was a little intimidated by the Ragu. I mean first of all, Luiggi’s is known for Italian food and their sauce is a masterpiece. Second, they include almost every single meat known to man in theirs. It just seemed like it would be a crazy long ingredient list and a big undertaking just to make meat sauce, especially when Luiggi’s is a short drive away. Recently though, I decided that I was ready for the challenge. My MTT is darn good to me and I wanted to make him a special meal. I started with some research on Ragu and found that there wasn’t so much a set ingredient list, but a few general rules that seemed to be part of every recipe. Ragu includes vegetables in the sauce. Ragu includes at least two meats. Ragu is more chunky and less saucy. Armed with these tips, I decided to make my own version. I only usually use onion and garlic for meat sauce, but I added celery and carrot this time. I used more meat and less sauce, and I chose four different kinds of meat. I also added cinnamon, which might sound weird but I’m almost certain I could taste it in Luiggi’s Ragu. I pre-cooked everything the night before and then let it simmer in the crock pot all the next day for depth of flavor. This made the house smell incredible. 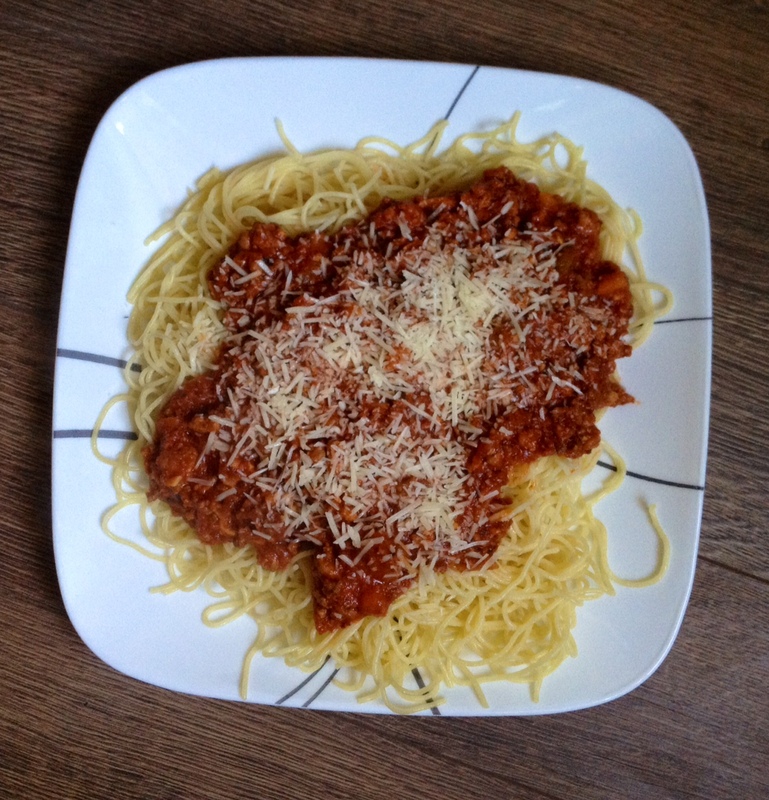 We had a dinner guest over that evening and both guys heaped their plates and raved over this meat sauce. I made salad and bread sticks too but both of those went almost untouched. They both wanted to eat as much meat sauce as they could. This is crazy hearty, flavorful and stick to your ribs. It’s perfect for this time of year and I bet any meat lover in your life will totally gobble it up. Oh, and did I mention there’s bacon in this? In a very large skillet over medium heat, sauté the four meats altogether, crumbling the ground meat. Cook until heated through but not too browned. Pour the cooked meat into a crock pot or large soup pot (see notes below). Add the celery, carrot, onion and garlic to the same meat skillet (leave the meat juices in it). Sauté the veggies until fragrant and starting to soften. Pour these in the pot or crock pot with the cooked meat. Add all of the other ingredients to the meat/veggie mixture and stir well. I put all of this in the crock pot and then refrigerate it overnight. Then the next morning, I put the crock pot on low for 8 hours to have it ready for supper. See other cooking options in the notes below, depending on how much time you have. Before serving the sauce, season it with extra garlic salt to taste if desired. You could just put everything together in a big soup pot on the stove to simmer on low if you are home for several hours instead of the crock pot. I just wanted it to be ready when I got home from work and couldn’t babysit it all day. If you have even less time, just stir everything together after cooking the meat and veggies and simmer it for 30 minutes or so before serving. It’s just been my experience that things like meat sauce and chili are always better the next day, and the longer they simmer, so I like to plan ahead if I have the time. This makes a big pot (my crock pot is a 4.5 quart and it was full to the top) and the leftovers are awesome. It also freezes great.